The U.S. Department of Labor has filed a lawsuit against The Ohio Bell Telephone Company, which operates as AT&T, after 13 workers were suspended without pay for reporting workplace injuries. The workers were disciplined and given one- to three-day unpaid suspensions for reporting injuries that occurred on the job, which violates the whistleblower provisions of the OSH Act of 1970. "It is against the law for employers to discipline or suspend employees for reporting injuries," said Dr. David Michaels, assistant secretary of labor for occupational safety and health. "AT&T must understand that by discouraging workers from reporting injuries, it increases the likelihood of more workers being injured in the future. And the Labor Department will do everything in its power to prevent this type of retaliation." OSHA enforces the whistleblower provisions of 22 statutes protecting employees who report violations of various airline, commercial motor carrier, consumer product, environmental, financial reform, food safety, motor vehicle safety, health care reform, nuclear, pipeline, public transportation agency, railroad, maritime and securities laws. Read the news release for more information. In response to a dramatic increase in injuries and fatalities at communication tower worksites, including recent tower collapses in Texas and West Virginia that killed two workers and a responding firefighter, OSHA is teaming up with the National Association of Tower Erectors to ensure that employers understand their responsibility to protect workers performing this high-hazard work. On Feb. 11, OSHA sent a letter to communication tower employers, urging compliance and strict adherence to safety standards and common sense practices. 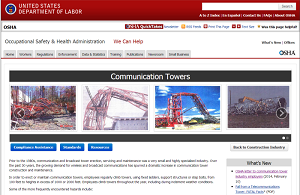 For more information, see the news release and visit OSHA's new Communication Towers Web page. OSHA is partnering with the Agricultural Retailers Association and The Fertilizer Institute to reach more than 7,000 agricultural retailers, distributers, producers and other facilities in the industry to remind employers of the importance of safely storing and handling ammonium nitrate. This effort follows the devastating April 2013 ammonium nitrate explosion in West, Texas, which killed 15 people, including 12 emergency response personnel. The trade associations will distribute a letter from Assistant Secretary of Labor for Occupational Safety and Health Dr. David Michaels to fertilizer industry employers throughout the country. In the letter, Dr. Michaels writes, "The tragedy in West, Texas, and other incidents underscore the need for employers who store and handle hazardous substances like ammonium nitrate to ensure the safety of those materials - not just for workers at the facility but for the lives and safety of emergency responders and nearby residents. I am calling on you today to take the necessary steps to prevent tragic ammonium nitrate incidents." For more information, read the press release. OSHA has issued a proposed rule to extend the compliance date for the crane operator certification requirement by three years, to Nov. 10, 2017. The proposal would also extend the phase-in requirement for employers to ensure that their operators are qualified to operate the equipment. OSHA issued a final standard on requirements for cranes and derricks in construction work on Aug. 9, 2010. The standard requires crane operators on construction sites to meet one of four qualification/certification options by Nov. 10, 2014. After OSHA issued the standard, a number of parties raised concerns about the qualification/certification requirements. After conducting several public meetings, OSHA decided to extend the enforcement date so that the certification requirements do not take effect during potential rulemaking or cause disruption to the construction industry. Comments must be submitted by March 12, 2014 and may be submitted electronically at www.regulations.gov, the Federal e-Rulemaking Portal or by facsimile or mail. See the Federal Register notice for submission details and additional information about the proposed rule. In August 2013, a 32-year-old machine helper entered a large wire mesh manufacturing machine to retrieve a fallen metal bar, and he was struck and killed by a part that feeds the wire into the machine’s welding area. The light curtain that would have automatically turned the machine off before he entered the danger zone had been disabled. Proper operation of the machine’s guards, a basic Occupational Safety and Health Administration requirement, would have saved his life. "This was a preventable and senseless tragedy," said U.S. Secretary of Labor Thomas E. Perez. "When employers are serious about safety, everyone benefits. Wire Mesh Sales LLC failed to properly implement OSHA safety regulations, and a worker paid the ultimate price." OSHA cited Wire Mesh Sales LLC for willfully failing to guard the wire mesh manufacturing machine as well as three other large machines, and ensuring that four machines, including the one involved in the incident, were shut down and locked or tagged out from hazardous energy sources prior to employees’ entering and servicing the equipment where no guards protected them from harm. The employer was also cited for repeat, serious and other-than-serious violations and the company has been put into OSHA’s Severe Violator Enforcement Program. Proposed penalties total $697,700. For more information, see the press release. OSHA has cited Lucas Marine Acquisition Co. LLC for 22 safety violations following the drowning death of an untrained worker. The employee died while doing surface supplied-air diving during underwater construction activities for the City of Fort Pierce Marina storm protection project on Aug. 6, 2013. The fatality was the second in five months for the company. Proposed penalties total $290,000. "Lucas Marine intentionally disregarded safety standards and sent construction workers underwater without proper training and without adequate equipment," said Condell Eastmond, OSHA's area director in Fort Lauderdale. "A worker should not have to sacrifice their life to earn a paycheck." Included in the citations to the employer are three willful citations for failing to ensure divers had adequate experience and training to perform the work safely, failing to provide workers with two-way voice communications for emergency assistance, and failing to ensure the designated person-in-charge was trained and experienced. The company has been placed in OSHA's Severe Violator Enforcement Program, which mandates targeted follow-up inspections to ensure compliance with the law. For information on citations issued, read the press release. OSHA has cited Wakefield, Mass., excavation and utilities contractor Joseph P. Cardillo & Son Inc. for willful and serious violations of excavation safety standards at a Milton work site. Cardillo faces $144,400 in proposed fines. "The proposed fines reflect both the gravity of the hazards and that the employer knowingly refused to comply with using required safeguards," said Brenda Gordon, OSHA's area director for Boston and southeastern Massachusetts. "These workers could have been crushed and buried in seconds beneath tons of soil and debris, without any escape options. This risk is unacceptable, and this employer has been cited previously for the same hazards." Prompted by a complaint, OSHA’s inspection found that the employer had workers installing water mains in a 6.8-foot deep trench with no cave-in protection and a ladder to exit. In addition to receiving willful and serious citations for failing to protect workers from trench collapse and failing to provide a safe means of exit, the company has been placed in OSHA's Severe Violator Enforcement Program. For more information, see the news release. 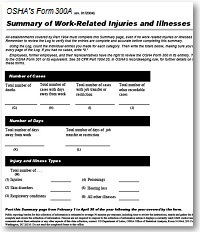 OSHA has announced that the comment period on the proposed rule to improve workplace safety and health through improved tracking of workplace injuries and illnesses will close on March 10, 2014. The comment period was originally scheduled to close March 8. However, this date falls on a Saturday. OSHA will accept comments submitted March 10 as timely submittals. The proposed rule would amend OSHA’s recordkeeping regulations to add requirements for the electronic submission of injury and illness information that employers are already required to keep. Comments may be submitted electronically at www.regulations.gov, the Federal eRulemaking Portal or by mail or facsimile. See the Federal Register notice for more details. WPAC is comprised of twelve voting members, representing management, labor, State OSH Plan states, and the public. Non-voting members include representatives from three Federal Government agencies that have jurisdiction over statutes with whistleblower provisions. For additional information, see the Federal Register notice. Secretary of Labor Thomas E. Perez has announced the appointment of 15 members and a special agency liaison to the Maritime Advisory Committee for Occupational Safety and Health. The 15 members selected by the secretary have experience in worker safety and health in the maritime industry. These include four members each representing management and labor, three members each representing the government and safety and health professions, as well as one member appointed by the secretary of the U.S. Department of Health and Human Services. See the news release for the names and affiliations of the members. From left: Secretary Perez and Ambassador Mendez during the consular partnership agreement signing ceremony. 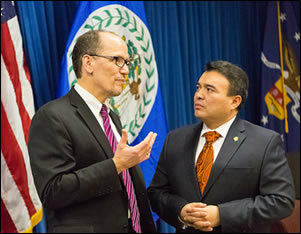 "We want all workers in the United States to know they are protected by our labor laws, and we want employers to know we have tools to help them comply with those laws," said Secretary of Labor Thomas E. Perez. "By signing this consular partnership agreement, we and the Embassy of Belize agree to work together to make sure that workers from Belize can get assistance when they need it." Currently the department also has agreements with Costa Rica, Ecuador, El Salvador, the Dominican Republic, Guatemala, Honduras, Mexico, Nicaragua, Peru and the Philippines. Read the news release for more information. 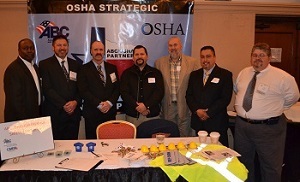 OSHA's Houston South Area Office is supporting the ABC State Partnership by providing technical support and training, attending monthly meetings, speaking at construction meetings, and providing other resources to help employers protect their workers. For more information, visit OSHA's Strategic Partnerships page. OSHA has issued a revised directive providing guidance on procedures for implementing inspection programs to reduce or eliminate hazards related to ship repair, shipbuilding and shipbreaking. Updates to the directive reflect recent changes to general industry standards in shipyard employment worksites and provide answers to common questions on shipyard employment, control of hazardous energy and general working conditions in shipyard employment. OSHA has released an updated version of the Cold Stress QuickCard, which describes common types of cold stress, risk factors, protection tips and recommendations in the event of cold stress. In addition, the Fact Sheet on Filing Whistleblower Complaints under the Affordable Care Act has been updated and is available in both English and Spanish. The revised fact sheet includes a summary of the Affordable Care Act, types of retaliation, coverage, and the process of filing a complaint.